Usually I keep my to-do lists as handwritten scrawls, as marginalia, as a schedule in my calendar, or I remember it. Once I’m in a project, I have a habit and I just keep most of it in my head (as I said in my interview with Eva Lantsoght for her This is How I Work series). This is the best way for me to get things done for myself. For example, I take notes in meetings using my Moleskine Professional Notebook, which sets out the page in a sort of reverse Cornell Method (with the summary at the top, and spaces for themes down one margin, plus the normal notes spaces). For me, the summary of the meeting is often a list of to do tasks, which keeps my tasks and my information about them in one place. But sometimes I just need a list on steroids, or a list I can share with others, or a list I can search through, or a list I can find when I don’t have my notebook with me, and that’s where Workflowy comes in for me. 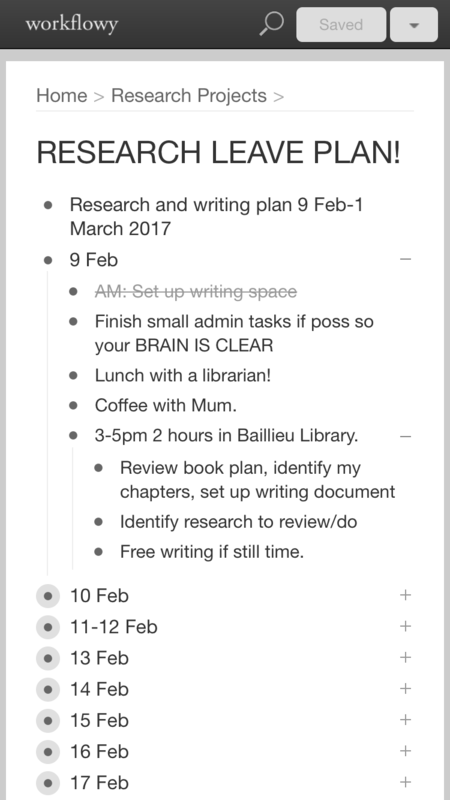 When I blogged about How to Plan your Research Days I talked about using Workflowy, an app I use to ‘get everything in my head out onto a page’–one of the To-Do Lists that Actually Work. I use Workflowy a lot at the beginning of projects, when there are lots of options for how I might progress (whether that’s the beginning of semester or the beginning of a research project). There’s a web interface and a very easy to use app for iOS (there are also apps for Android and Chrome which I haven’t tested). You literally can use it like a shopping list. No need for tags, deadlines, etc, it can just be a quickly scrawled list. You can view the list all on it’s own (great to focus) or in among all the other things you have to do (great for time planning). It has lots of extra functionality that you can use if you want it. I share my lists with my teams. It copies and pastes text well, as well as exporting easily, making it easy to use what’s in Workflowy in emails, reports etc. It’s easy to customise so you show completed items, or you hide them. You can expand and collapse sections. I just looked at my most recent entries, and they say things like ‘Work’ or ‘Book writing’. Now I’m in the flow of the job and the book, I don’t need detailed instructions. I know what works for me doesn’t work for everyone. And you can see that what works for me in February doesn’t work for me in April. That’s great–we are complex human brains working on complex multi-layered tasks. Take some time to reflect on how you do brain dump your tasks, and think about which ones are working for you, when it works, and what you are still searching for. There is no one perfect app, but time management programs (and paper notebooks!) are improving all the time, so if your current system isn’t helping, it might be time for a new system.